The ball crater test (Calotest) is a well established method for the determination of layer thickness. With a rotating steel ball and an abrasive slurry, a spherical cap is ground through the coating into the base material of the sample. When examined with a microscope, the layer/base material interface appears as a circle or, in case of a multilayer coating, a system of concentric circles. The layer thickness can be calculated from the diameters of these circles and the diameter of the grinding ball. 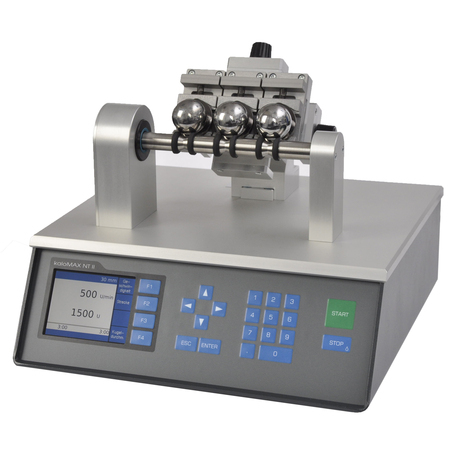 This purely geometrical method gives highly accurate results even for layer thicknesses in the range of micrometers. Evaluation and documentation can be further simplified by the software kaloSOFT and a camera-equipped microscope.